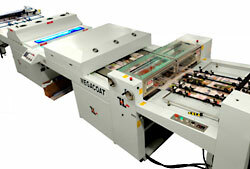 The MegaCoat UV coating system is a high production solution designed for the most demanding medium and large format offset printer requiring offline flood coating capabilities. 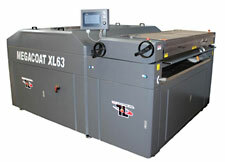 Available in 3 popular formats, MegaCoat coaters are a cost effective alternative to high cost inline UV coating stations. These versatile turn-key coating systems are equipped with high-capacity pallet loaders, rear pickup steam feeders, heavy duty coating stations with 7” diameter rollers, conveyor system and unloading receding pallet stacker. Their 3 - 7" diameter roller design provides smooth and uniform coating application. A combination of 4 IR and 2 UV lamps provides exceptional flow and fast cure of most any coating formula.